African Red-Billed Hornbill, mostly because this is the type of bird that Zazu is in the movie “The Lion King”, which is one of my all time favorite movies. The birds got their name because the shape of their bills resembled a cattle horn. They can be found all across Africa, but mainly found in open savanna, woodlands, and in sub-Saharan Africa. Red-Billed Hornbills are the smallest of all the Hornbill species, weighing less than a pound. They usually live in pairs or small groups for companionship.They are very territorial birds but not towards their own species. 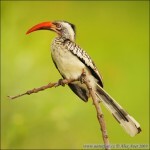 Meaning there could be many different kinds of Hornbills in one particular area. Females will usually lay around 3 to 6 eggs. She seals herself into a tree hole with mud, leaving a space only big enough for the male to bring her food. After about 24 days the chicks will hatch, but the mother bird and her chicks will remain in the nest for about 20 days before breaking open the mud walls. The chicks will stay with their parents for 6 months before leaving them for good. Red-Billed Hornbills have the life span of about 15 years. Their significance to African culture is unknown. The only information given having to do with culture is that the Red-billed hornbill was used in The Lion King, The Lion King 2: Simba’s Pride and The Lion King 1 1/2 to represent the character Zazu.